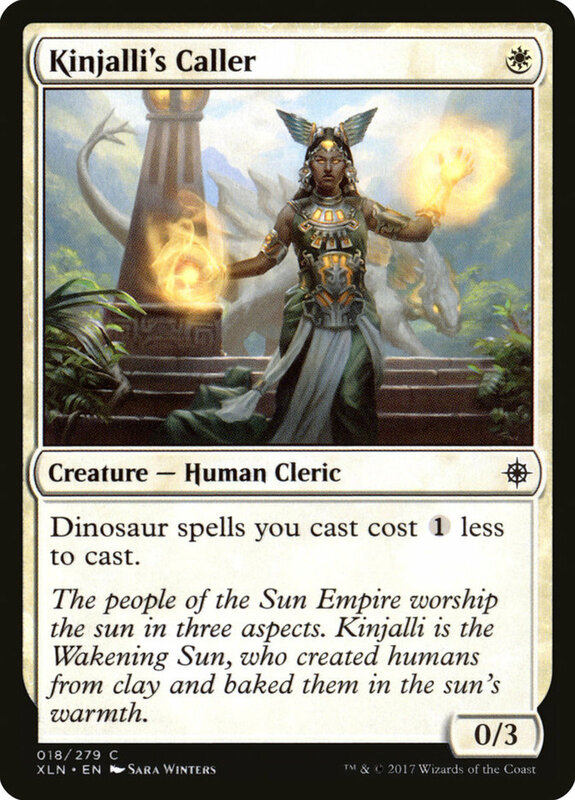 In Magic, dinosaurs are a powerful creature subtype seen among the red, white, and green factions. They require hefty sums of mana, but reward you with powerful battle stats and often the trample trait, letting them bleed excess damage through blockers. Some of the best dinosaur supports are dinosaurs themselves, but several non-prehistoric cards also boost their ranks. With dozens of backups available, which allies reign supreme? 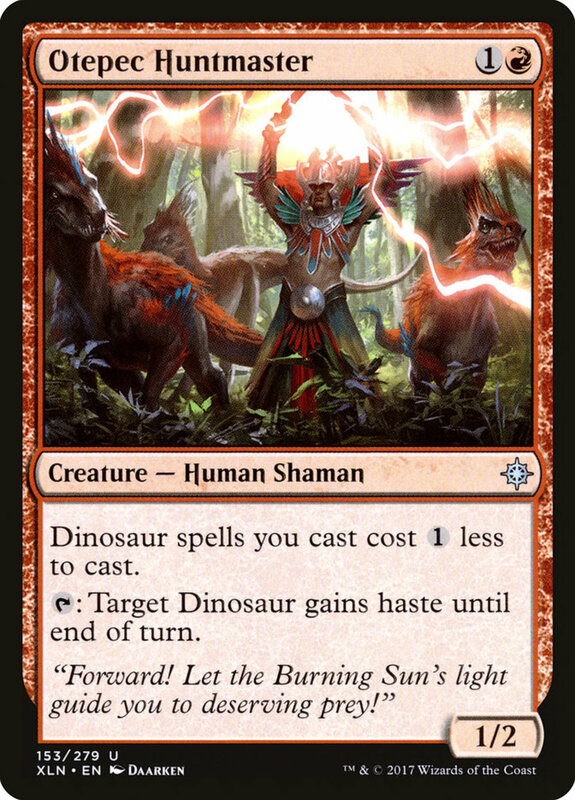 These are the ten best dinosaur support cards in Magic: The Gathering! Planeswalker Huatli is a mixed bag. 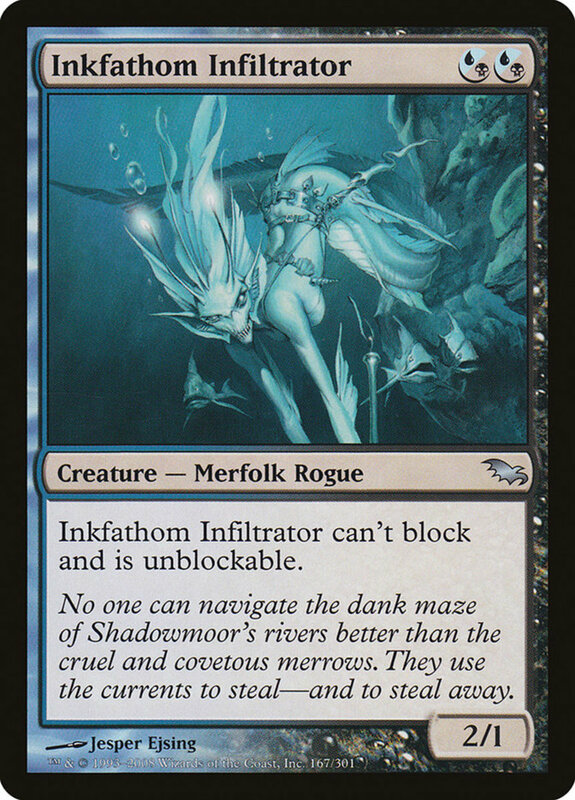 She costs a substantial amount of six mana, enters with only four loyalty, and her abilities only work with dinosaurs. That said, they're decent effects, and her colors correspond with dinosaur hues. 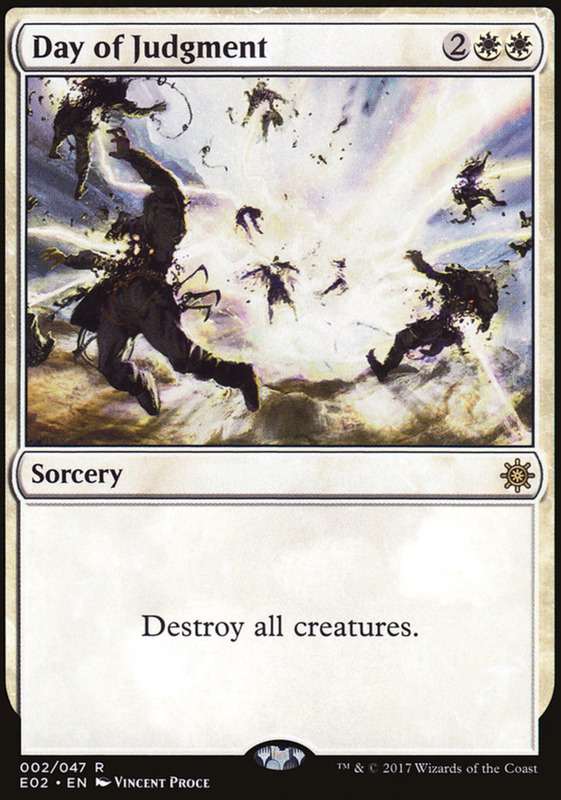 +2 loyalty lets you add up to two +1/+1 counters to a dinosaur, -3 has your dinosaur deal damage to an opposing creature equal to its power, and -7 grants your dinosaurs +4/+4 until the end of the turn. 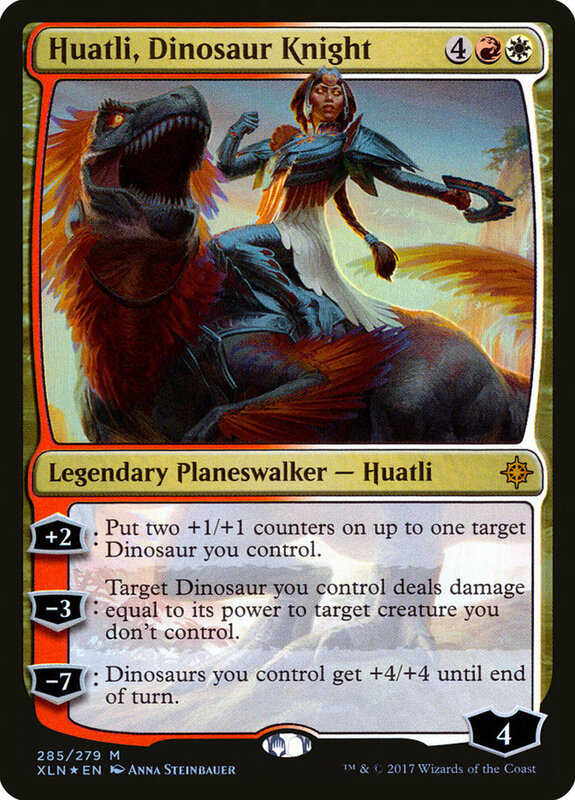 Huatli would be great if only she cost a bit less mana; as is, she's still a late-game option to consider. Note that her -3 offers a great removal similar to the fight mechanic, except your opponent's creature doesn't hit your dinosaur back, letting you strike without fear of retaliation. Like many dino supports, Seer is a human creature. For three mana, his 2/3 (two power and three toughness) are only decent, but he can tap to add a single mana of any color. 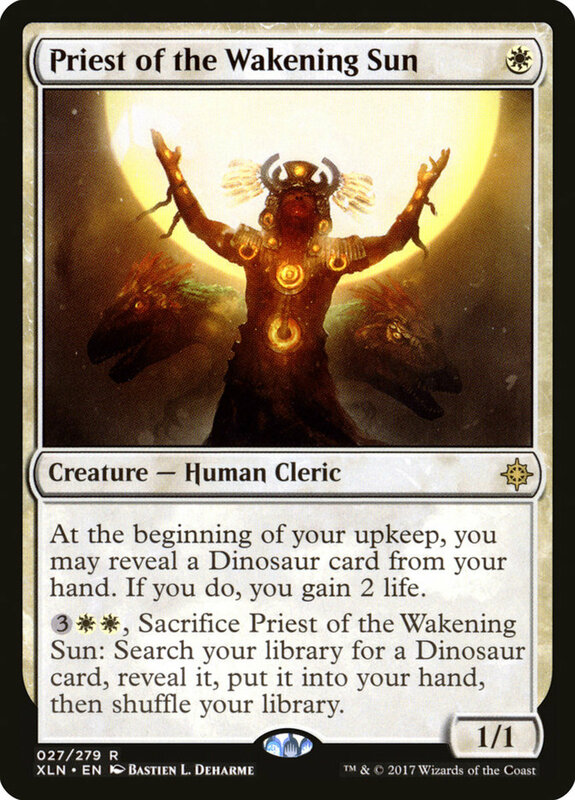 Additionally, you can sacrifice Seer to return a dinosaur from your graveyard to your hand. 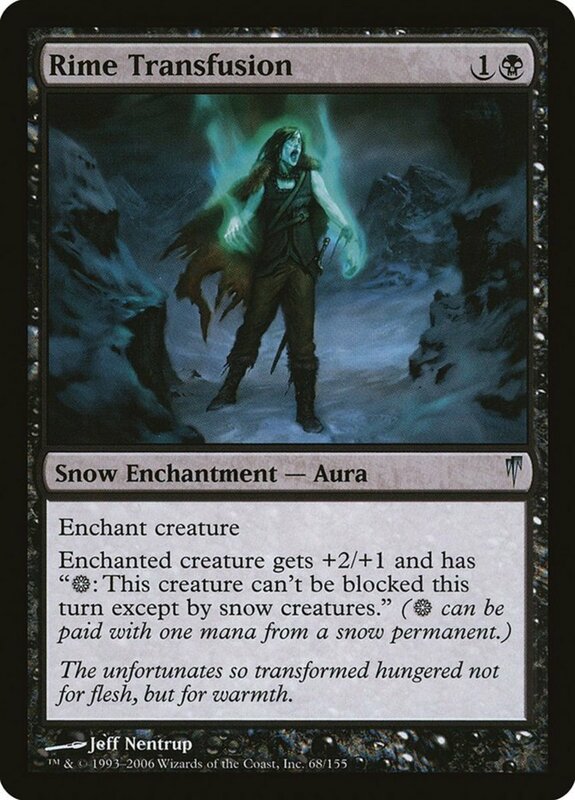 This ability works at instant speed, letting you get some final usage out of Seer before he would fall to a removal. Priest only costs one mana, but his stats are a correspondingly low 1/1. However, at the start of your upkeep, he lets you reveal a dinosaur card from your hand to gain two life, an excellent way to continuously boost your life points throughout the match. Plus, if you later have mana to spare, you can spend five resources and sacrifice Priest to add a dinosaur from your deck to your hand. This is a rather expensive search, but it's still nice to have available and can be activated in response to a removal. 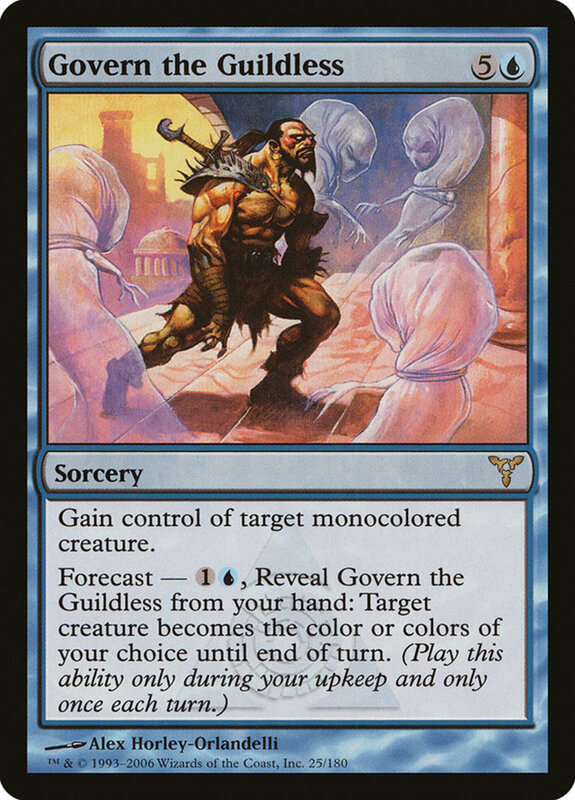 Like Seer, Drover can tap for a mana of any color. However, he's easier to field thanks to his lower cost and singular color requirement. 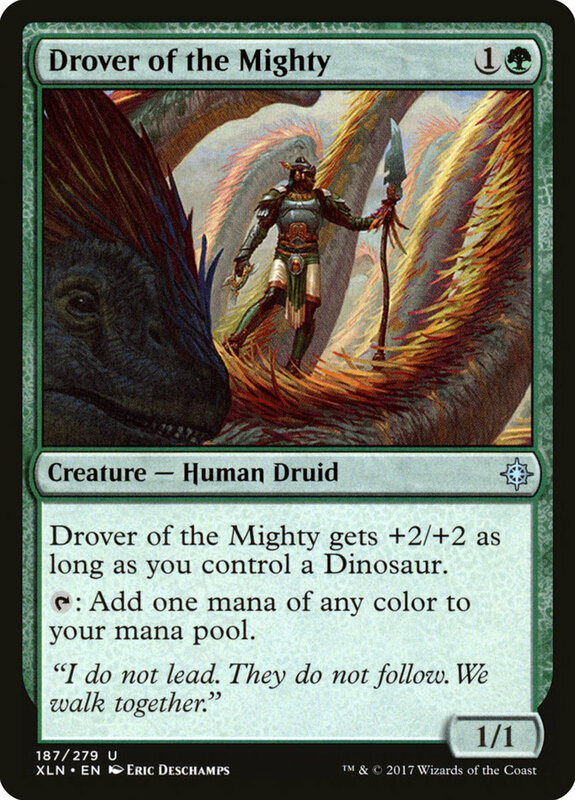 While his stats are a puny 1/1, he gains +2/+2 if you control a dinosaur, granting an early-game beatstick who can also assist with mana ramping. Use the block-tap combo to declare Drover as a blocker against an attacking enemy, then immediately tap him for his mana. He'll both block the unit and you'll gain a resource—just be sure to spend it on instant or flash spells before it fades out when the combat phase ends. Forerunner has two effects that initially don't look great, but are more useful than they seem. His 1/3 stats are disappointing for his cost, but when he enters the field, you can move a dinosaur from your library to the top of your deck, gimmicking your next draw into whatever titan you need. 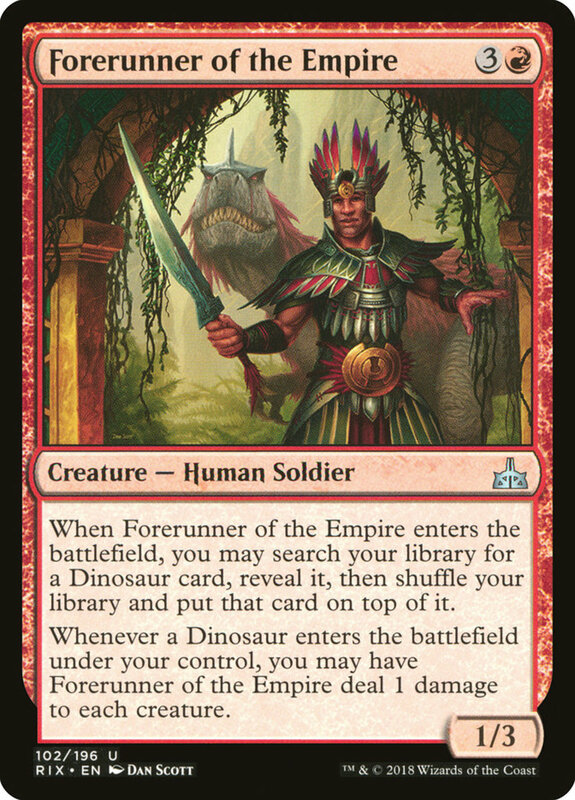 Additionally, whenever a dinosaur enters the field under your control, you can have Forerunner deal one damage to all creatures. While this scrapes your own units as well as your opponent's, remember that many dinosaurs activate bonus abilities when injured, meaning it's actually helpful to hit them with small amounts of damage. 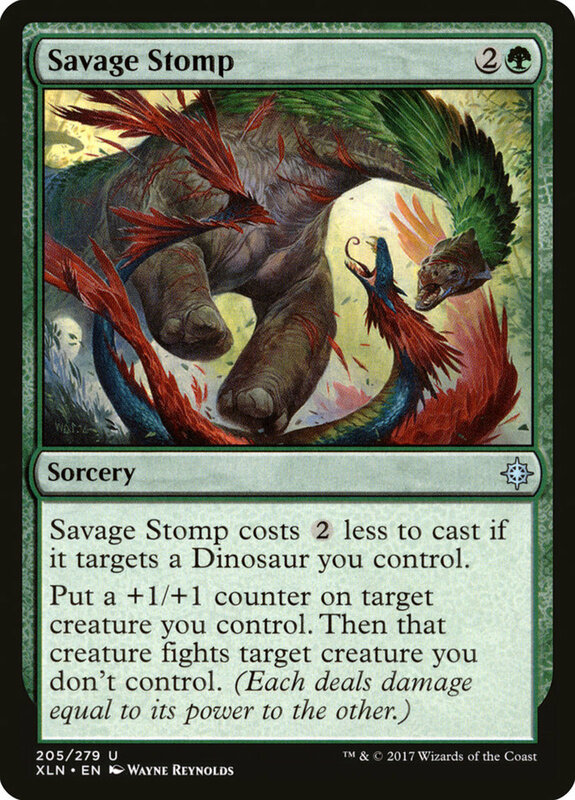 Savage Stomp costs two less mana if used on a dinosaur, meaning you should be able to cast this sorcery with a single forest land. First, it places a +1/+1 counter on a creature you control, then it has that unit fight an opponent's monster. This has them both deal damage to each other as if they had engaged in combat (but neither is tapped). Fighting is a great way to force weak utility units into unwanted battles, removing your foe's troublesome creatures without having to spend other removals, and the +1/+1 counter perfectly prepares your champion for the skirmish. Commune with Dinosaurs only needs one mana, making it a great outlet for leftover resources. 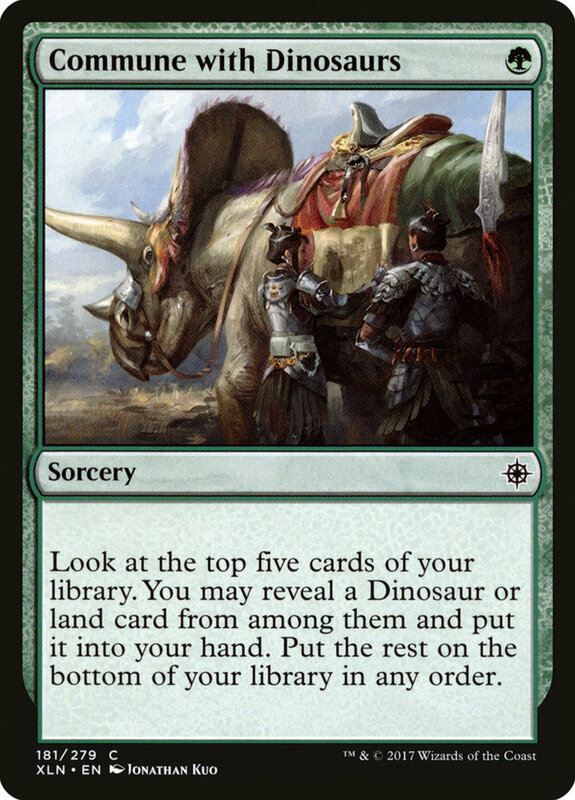 It lets you look at the top five cards of your deck and add either a dinosaur or land from them to your hand, placing the rest on the bottom of your deck in any order. It's as simple as that; use Commune for a quick and adaptable search. Afterwards, this sorcery helpfully fills your graveyard for "spell mastery", "delirium", and "threshold" effects. 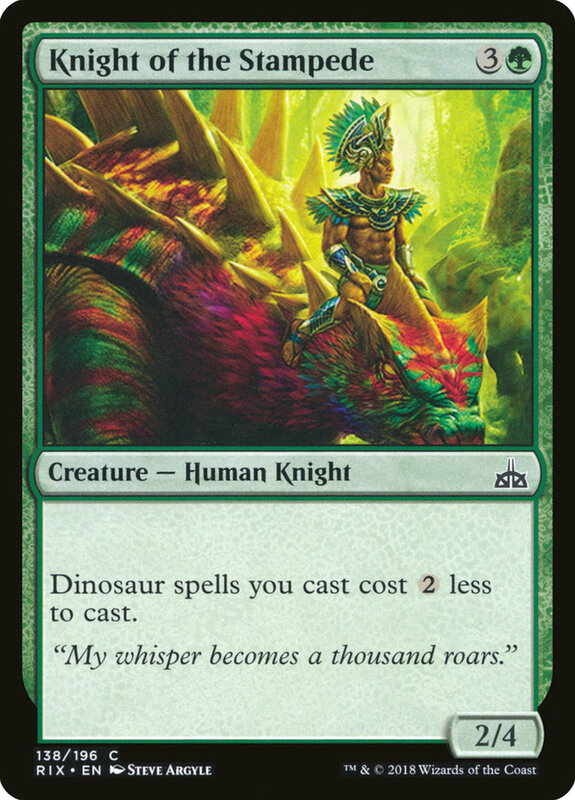 Knight of the Stampede costs four mana and only wields 2/4 stats, but he offers a spectacular power that reduces the cost of your dinosaur spells by two colorless mana. Use this to field aces like "Gishath, Sun's Avatar" and "Etali, Primal Storm" at a handy discount, accessing them much more quickly. Plus, since Knight never needs to tap for his effect, he'll remain refreshed and ready to enter battle whenever needed. Like Knight, Huntmaster reduces the price of your ancient reptiles, but this time it's only by a single colorless mana. Still, that's a handy reduction, especially since Huntmaster only requires half of Knight's mana. As a bonus, he can tap to grant a dinosaur the haste trait until the end of the turn, letting them attack or tap even if they just arrived. Two great dino supports at one low cost. 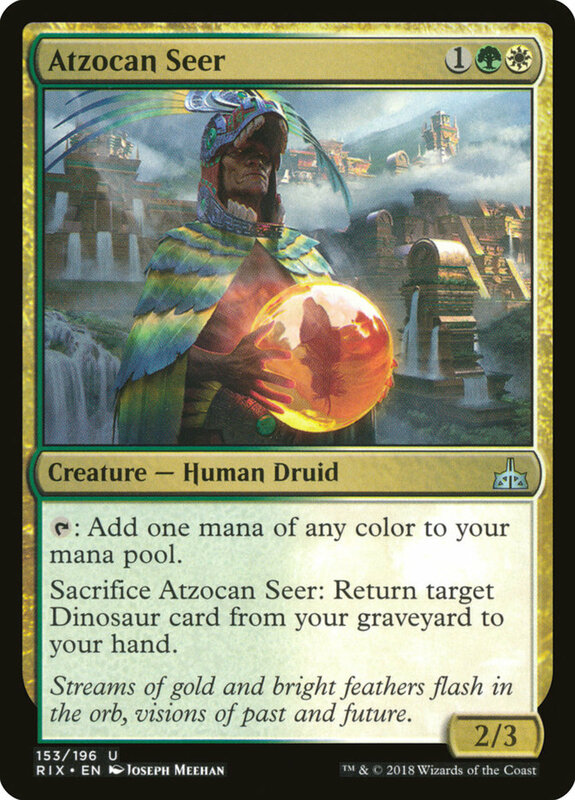 Similar to our last few entries, Caller reduces the price of your dinosaur by a single colorless mana. He can't grant them haste like Huntmaster, but he only needs a single mana, and his 0/3 stats are surprisingly high for this price. 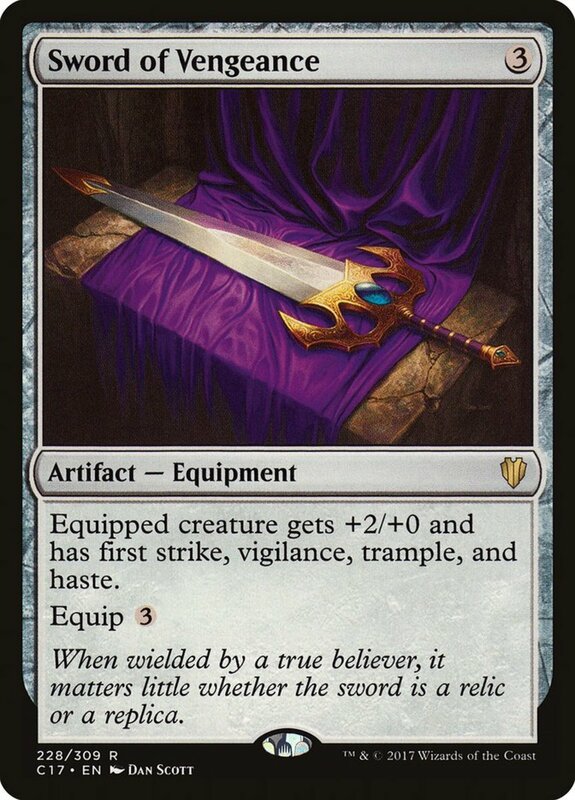 Thus, Caller serves as both an early defender and a tool to access your boss monsters faster, quite a bargain for a single mana. Note that these effects stack, meaning you can reduce your dinosaurs to amazingly cheap fees if your field multiple price-dampeners. 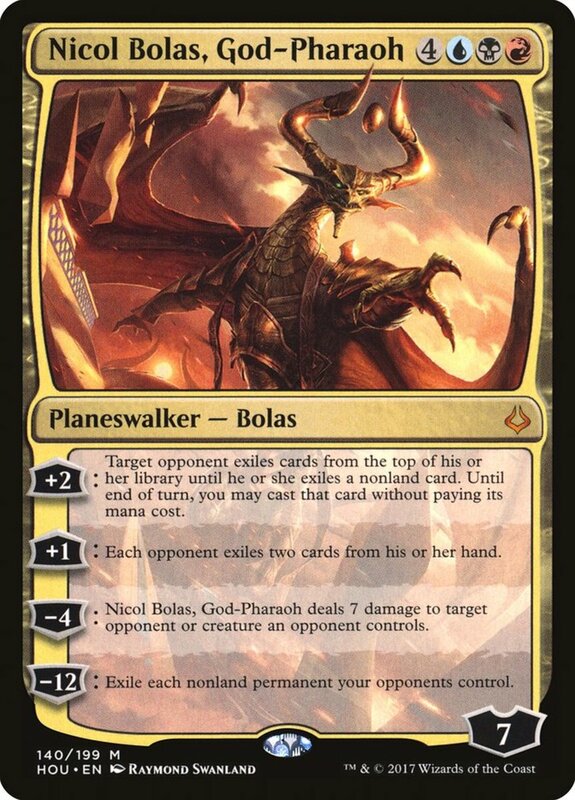 Caller's an easy pick for my own dinosaur commander decks, especially since he's ridiculously cheap, often costing less than fifty cents! Today we've tackled several awesome non-dino dinosaur supports, but be sure to review the best dinosaurs themselves for more inspiration. "Regisaur Alpha" grants your other titans haste while "Gishath, Sun's Avatar" can play them from the top cards of your deck when he damages an opponent. Dinosaurs remain one of my favorite factions for their intimidating designs, aggressive playstyle, and impressive supports, but for now, as we eagerly await Wizards of the Coast's next expansion of prehistoric monsters, vote for your favorite card and I'll see you at our next MTG countdown!